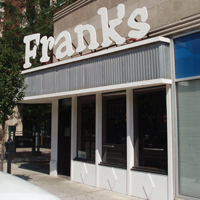 FRANK'S is one of our top choices for a great (and late!) night out. They are open until 4:00 AM Monday thru Friday, and on Saturdays they are open until an unbelievable 5:00 AM. Sunday is the only night of the week that they close up shop early, at midnight. The jukebox has great selections no matter what your musical tastes, ranging from 80s hits to 90s grunge and today's hip hop too. Incredible drink specials will help you to keep the bill very low, and when you combine that with the very late hours, you can party into the wee hours and still spend less than you would at most other establishments!